The Best Size Spinning Reel for Inshore Saltwater Fishing: For inshore duties catching snook and redfish inshore, the 40 (4000) is the best size choice. It's got enough size and strength to handle a large 25 lb plus fish, and yet light enough it won't start getting heavy by the end of the day. A smaller reel like a 3000 may give you more feel and may perform fine if you're planning to only catch small fish around 20 inches or smaller. The risk you take is a big 40 plus inch snook coming along and completely spooling your reel within seconds and then breaking off. For larger game such as tarpon and sharks, we choose the 60 (6000) for its higher line capacity and pounds of drag. You'll also want to have the correct rod and reel combo for the weight of fish you're catching. Our 40's go on the 7'6" fast action snook rods and the 60's go on the medium heavy 8' tarpon rods. Make sure you choose the right weapon for the battle. Late in the spring and into through early summer is the Boca Coast Snook Run. This is when the big breeder females begin to stage up near the passes and then move along the beach and feed during a good tide. If you want to catch monster snook, this is the time to fish. Live bait with a 1 oz sinker at the top of the leader and a #3 or #4 hook is the tackle setup here. There are also tarpon cruising the beaches so you want to have you 8 ft medium/heavy tarpon rod on hand. We use live bait that we chum up and catch with a cast net, preferably a hand sized pin fish or candy bar sized white bait (herring, menhaden, etc) and the Fin-Nor Bait Teaser reel. They don't call it Bait Teaser for nothing. It has a dual drag system that allows you to literally free spool the bait and have a light setting for the hook set and then with the flick of a switch go to a tight drag and stop the fish. It's got brakes! This is a Huge advantage for several reasons; when using circle hooks you want the drag to be light in order to get a proper hook set in the corner of the mouth. If the drag is too tight, the hook can easily pull and the fish might pull your entire rig into the water. With this reel you can set it up, wait for it to scream and then hit the breaks. Build Materials and What to Look For: Our criteria for reviews of reels is not as comprehensive as some. We rely on a few major components that make or break the reel. We have a large group of expert guides and charter captains who provide us with feedback. In the end, in order to make it to our list of the best reels; it has to be tough. Anti-corrosion build materials are vital to it's overall longevity and durability. The drag is the single most important component of a reel. The problem with less expensive reels is they use lower quality drag system materials. The result is a drag that wears out quicker and performs worse each time it's used. Hook into a 43" snook or redfish and tighten down the drag and you may experience a drag that simply can't hold the fish. Much like the breaks on you car, a drag system made with weak materials can get overheated on a large fish and be rendered worthless quickly. 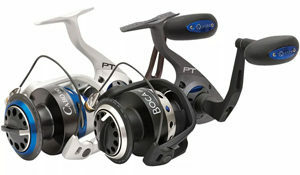 The best reels utilize heat-dissipating drag system materials like carbon fiber and stainless steel. Finally, the bail wire is the connection between your braid and the reel. This is often a fail point of cheap reels. This is where many manufactures use poor materials that rust, corrode and break under pressure. A reel with a tight bail wire made from materials that will last, is something we look for and must have. Conclusion By Charter Captains and Experts: The Quantum Cabo PT series of reels have all the features that matter when it comes to performance and longevity. Our captains put these reels through the ringer on a daily basis and they hold up. After countless fish and screaming drags, there are no complaints about heat fade or lack of power to tighten down and stop a blazing fish. This is remarkable for a reel in this price range. They maintain a smooth as silk retrieve and with the Maxcast spool lip (tapered) they cast live bait further with ease. The Cabo's are simply an engineering marvel and will outperform reels that cost several times more. For the money, they have outlasted the competition on several levels and they are the best. If you're not out on the water every day, you may end up passing these reels down to your kids.